The Ireland captain joins a lengthy injury list ahead of tomorrow’s friendly in Wroclaw. Coleman has been ruled out with a foot problem. 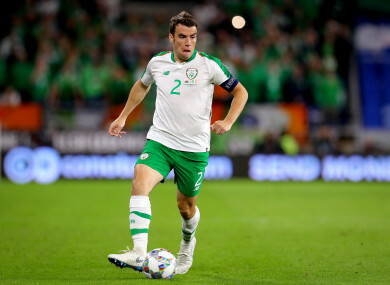 SEAMUS COLEMAN HAS been ruled out of Ireland’s friendly international against Poland tomorrow evening through injury, thus stretching Martin O’Neill’s threadbare resources further. The Ireland captain will miss Tuesday’s clash in Wroclaw with a foot injury, joining a lengthy list of absentees including James McClean, Jon Walters, Harry Arter, Stephen Ward, Alan Browne and Shane Long. Walters, who played the 90 minutes against Wales last week, has been released back to Ipswich, while Ward has also been ruled out with a foot problem and Harry Arter and Declan Rice are unavailable for differing reasons. Coleman’s withdrawal offers Wolves defender Matt Doherty the chance to stake his claim for selection and add to his two international caps, although Cyrus Christie will most likely get the nod to deputise at right-back. Portsmouth midfielder Ronan Curtis, who has made a bright start in League One after his summer switch from Derry City, has been called up by O’Neill. Ireland are looking to rebound from last Thursday’s heavy defeat to Wales in their Uefa Nations League opener, with kick off at the Municipal Stadium in Wrocław at 7.45pm [Sky Sports Mix]. Email “Coleman the latest player to drop out for Poland as O'Neill's squad stretched further”. Feedback on “Coleman the latest player to drop out for Poland as O'Neill's squad stretched further”.